Checked-out items can be renewed if your library’s policy allows it. The new due date is calculated from the renewal date. Existing loans can also be extended to a specific date by editing the due date or renewing with a specific due date. 1) Retrieve the patron record and go to the Items Out screen. 2) Select the item you want to renew. Click on Actions for Selected Items → Renew. If you want to renew all items in the account, click Renew All instead. 3) If you want to specify the due date, click Renew with Specific Due Date. You will be prompted to select a due date. Once done, click Apply. Renewal can also be done on the Item Status screen. See the section called Item Status (F5) for more information. 1) To renew items by barcode, select Circulation → Renew Items or press CTRL-F2. 2) Scan or manually entire the item barcode. 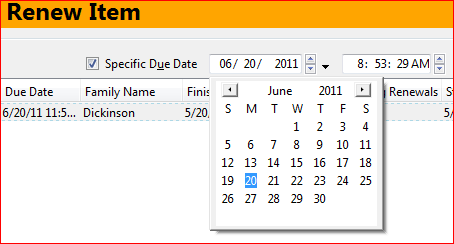 3) If you want to specify the due date, click Specific Due Date and select a new due date from the calendar. 2) Select the item you want to renew. Click on Actions for Selected Items → Edit Due Date. 3) Select a new due date in the pop-up window, then click Apply. You can select multiple items by pressing down the CTRL key on your keyboard and clicking each items you want to edit. Editing a due date is not included in the renewal count.